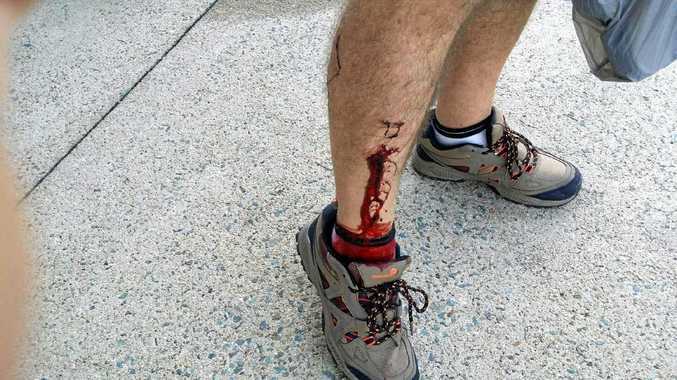 BAD BITE: A man was attacked by a dog while riding a bike on Shute Harbour Dr Cannonvale last week. HE was just going about his business when out of the blue a vicious dog took a chunk out of his leg. Riding his push-bike on the way to Whitsunday Plaza a 78-year-old man was has been attacked by a dog on Shute Harbour Rd opposite the BP service station in Cannonvale last week. The man who asked not to be named and suggested it was not an isolated incident. When receiving treatment at the Prosperine Hospital the man was told by nursing staff he was the third dog bite victim to be treated in the previous 24 hours. "You have got dogs that are unleashed and the dog that bit me, if I had been a young child riding past on a bike and been attacked imaging the damage it would do." The man described the dog as a brown medium-sized "terrier type" dog. The dog bite victim received two stitches and a course of intravenous antibiotics. Police are investigating an alleged assault in relation to the dog attack which took place on May 31 at 6.40am. Police say the man was attacked by the dog in the company of a male and female. The victim spoke to the dog owner, quizzing him about the registration details of the dog. A disagreement ensued and the dog owner allegedly pushed the victim off his bike. Anyone who knows anything about it is asked to contact Whitsunday Police.